Smooth Fox Terriers are small muscular dogs with strong jaws and a tapering narrow head. Their tails stand straight up and their compact bodies allow them to be both strong and fast. The Smooth Fox Terrier is easy to groom, requiring regular brushings with a firm bristle brush. Smooth Fox Terriers are average shedders. This energetic fun loving dog is affectionate and playful. Smooth Fox Terriers are scrappy and impulsive and have been known to bite, so should be watched around children. Smooth Fox Terriers are courageous and devoted and make excellent watchdogs, though have been known to bark excessively. Smooth Fox Terriers like to explore so should be kept in a safe enclosed area, and will sometimes even kill birds or small animals if given the chance. Deafness can be a problem in mostly white dogs. 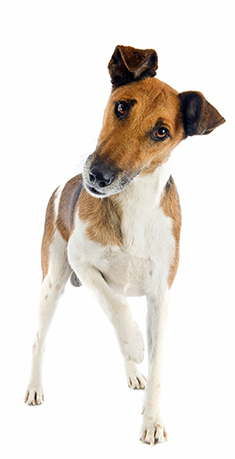 Smooth Fox Terriers may be susceptible to nasal drip, lens luxation, distichiasis, cataracts, Legg-Perthes, and shoulder dislocation. Smooth Fox Terriers can do okay in an apartment but love to go on walks and romps in the park. Smooth Fox Terriers should be kept on a leash near small animals including cats and smaller dogs, or the urget to chase them will be irresistable. Find Fox Terrier (Smooth) Puppies with our Free Breeder search!